Everybody was Kung Fu fighting, on the BBC. Published on July 25, 2008 in BBC (Other) and Videos: Promos. 4 Comments Tags: bbc, olympics. 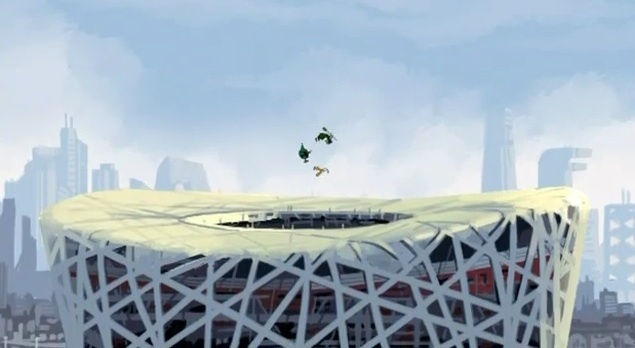 Here’s a challenge for you: condense a 400-year-old, 100 chapter Chinese novel into a two minute animated trailer for the upcoming Beijing Olympics. That’s right, they’ve abandoned the traditional “gold-infused slow-motion footage of athletes” Olympics imagery in favour of something a bit more creative. Animated by Gorillaz creator Jamie Hewlett with music by Damon Albarn, this video of Monkey and his friends made its debut last night in the UK at 7:27pm with a simulcast across BBC One, BBC Two, BBC Three, BBC Four and BBC News, and will form the centrepiece of the BBC’s Olympic coverage branding. This could stand on its own! The 3 characters are the main characters in China’s most famous myths in case you were wondering.